Fourier transform infrared (FTIR) microspectroscopy has been shown to be useful in cancer research at the single cell level. For example, the invasive properties of malignant prostate cancer ‘PC-3’ cells have previously been studied to improve understanding of cellular migration through tissue with the use of chemical mapping with Synchrotron radiation . The chemical specificity of FTIR imaging may also provide valuable information for the analysis of novel anticancer compounds in terms of efficacy in drug-cell interaction studies. Historically SR-FTIR imaging of single cells has been limited to a lower achievable spatial resolution relative to the nanometre resolving power of Raman imaging due to the diffraction limit. Recent advances in synchrotron-based technology at the IRENI beamline (Synchrotron Radiation Center, Wisconsin, U.S.A) has provided a means to achieve much improved spatial resolution with fast data acquisition speeds using a focal plane array (FPA) system and an experimental setup comprised of 16 Synchrotron beams . Single cell analysis has also been hampered by spectral perturbations caused by resonant Mie scattering (RMieS). Such perturbations include peak shifts and distorted baselines which has made correct interpretation of the true chemical information difficult. The ‘RMieS-EMSC’ correction algorithm has been developed as a consequence of increased understanding of this physical phenomenon . 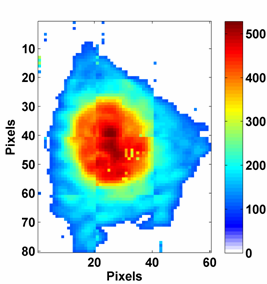 An infrared image of a PC-3 cell has been acquired at the IRENI beamline to demonstrate the application of the RMieS-EMSC correction algorithm to improve spectral image quality and sub-sequential analysis for SR-FTIR cell images at the diffraction limit. E. Gazi et al., Vibrational Spectroscopy. 38, 193–201 (2005).